Amaranthine Flowers By Design offers you this stunning arrangement in purples and white, with long lasting blooms, stock, vanda orchids, liatris, gerbera and lush green foliage in a ceramic base (flowers will vary based on availability). A unique arrangement, this will look gorgeous, adding a special touch to any room and make a fabulous gift to friends, family or business to business to say congratulations, thinking of you or just because. 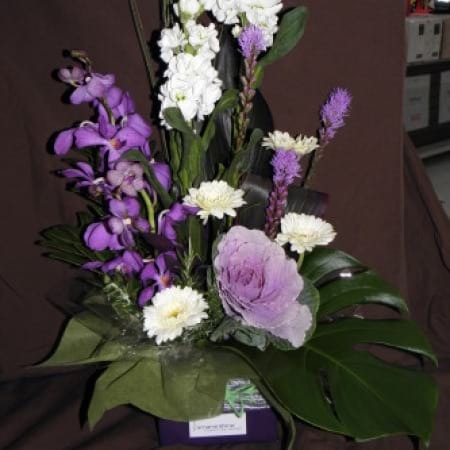 Created by Amaranthine Flowers By Design, your local florist in New Lambton.